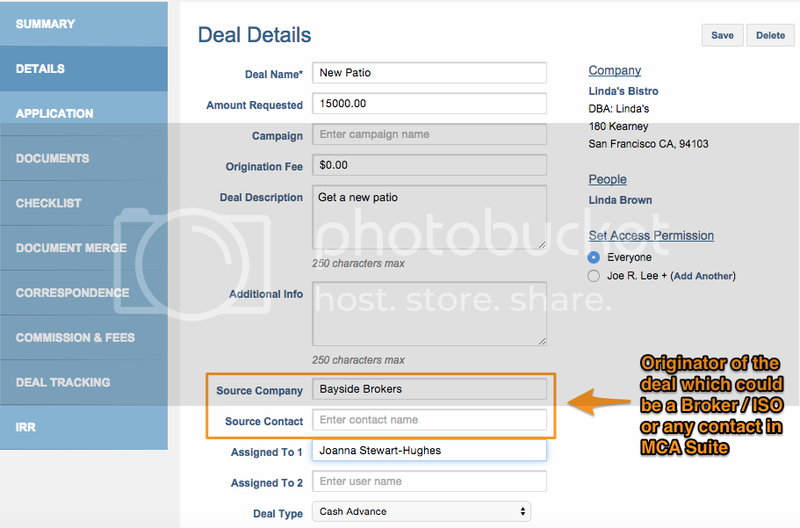 On the Deal Details page, MCA Suite allows you to capture where you received the lead for the deal. In other words, this is where the deal originated from which usually is a broker/ISO or another contact in MCA Suite. Source Company and Source Contact is where you should put that information. The "Source Company" field performs a lookup on all contacts (that are companies) in the MCA Suite database. Once "Source Company" has been selected, the "Source Contact" performs a lookup for contact persons associated with the selected company. In the above example, Bayside Brokers has been selected as the source for the deal and when you type in the "Source Contact" field, MCA Suite will lookup for contacts associated with Bayside Brokers. If you do not select a "Source Company" and begin to type in the "Source Contact" field, MCA Suite will perform a search against all contact persons in the MCA Suite database of your subdomain.